My husband loves novelty tees, so I am always on the lookout for amazing deals as they are harder to find in Canada. 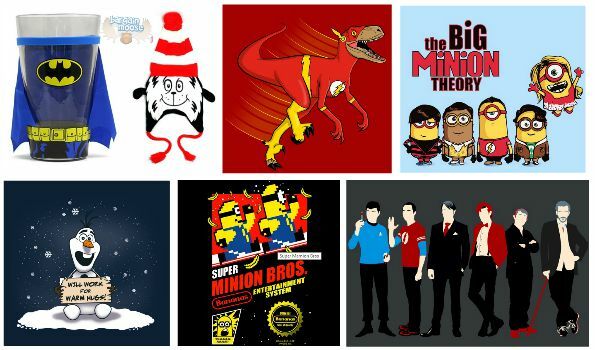 If you love The Big Bang Theory, Minions, Super Heroes, Dr. Who and much more you need to check out these amazing shirts. Neatoshop is currently offering free worldwide shipping, which saves you between $3.95 and $6.95 depending on the size of your order. Last night my husband sent me a link to a hilarious shirt of a Batnion, a Minion dressed up as Batman. The shirt is a great price at $19.95. I was clicking around the site and realized these hilarious tees have totally free shipping worldwide right now, which makes this hard to find shirt an awesome deal! I was showing Anna this website, and within several minutes received this message. Bought one. I haven't bought myself an item of clothing in about a year! I could spend a ton on that site. If you are curious what shirt she bought, you should check out The Doctors for $19.95 featuring different popular doctors from TV such as Sheldon from the Big Bang Theory, Spock from Star Trek and more. Many of these designs are also available on onesies, bags, hoodies, iPhone cases and more. Here are some of my favourite designs, featuring the t-shirt price. Over in the sale section, I did find a few items that caught my eye and were not shirts. Check out the Batman Oversized Pint Glass. This fun glass was $29.95 but is on sale for $14.95. I could not find this fun glass anywhere else in Canada, but the price is perfect. I also found this super Cat In The Hat Dr. Seuss Hat that was originally $19.95 but is now only $9.95. My daughter would go nuts over this hat. Neatoshop specializes in t-shirts and printed items that feature popular characters, are hilarious or are just a twist on your average character t-shirt. These character designs for popular shows are just hard to find in Canada, let alone some of these fun designs. Neatoshop also supports indie artists by offering their designs, so your purchase can help support smaller artists and illustrators directly. Avigayil blogged about Neatoshop back in November, which was the last time we have seen a similar promotion. Several other Bargainmoosers in the comments mentioned that the shirts were printed on quality 100% cotton Hanes shirts. Since this is a US company, it is possible to have duty fees if your order is more than $20. With free shipping, you could place more than one order to help avoid getting charged a duty fee. Bargainmoosers who have ordered from this site are reporting they were not charged duty fees. I totally wish I would have seen this sale before I picked up some new t-shirts for my husband at ThinkGeek. I just paid some hefty shipping charges to get those shirts to my door. This sale at Neatoshop is only on for a few days, so pick up your favourite now! Ha ha!! Can't wait for my new tee. Looking forward to seeing the quality and fit as it's the first time I've ordered from them. Just got my tee! I love it!